Do you have a scientific issue to address? Wish you had dozens, hundreds, even thousands more people helping you out? There’s help out there, and now that help is easier than ever to find. The General Services Administration (GSA) yesterday launched CitizenScience.gov, a new central hub for citizen science and crowdsourcing projects across the federal government. Like Challenge.gov before it, this new site makes it easier for federal agencies to collaborate with each other and seek help from the American public to address critical issues. First, a couple quick definitions. Citizen science and crowdsourcing allow agencies to engage with the public to enhance scientific research, address societal needs and provide hands-on learning experiences in science, technology, engineering and mathematics, otherwise known as STEM. In crowdsourcing, organizations submit an open call for voluntary assistance from a large group of individuals for online, distributed problem solving. In citizen science, the public participates in the scientific process to tackle real-world problems. Volunteer participants may formulate research questions, conduct experiments, collect and analyze data, interpret results, make new discoveries, develop technologies and more. As stated in this memo from White House Office of Science Technology Policy, federal agencies should establish citizen science and crowdsourcing projects that contribute directly to a goal or need relevant to their missions. Now, onto the new site, which was developed in partnership with the Woodrow Wilson Center International Center for Scholars in response to the memo mentioned above. CitizenScience.gov makes it easy for agencies to advertise, find and learn how to run citizen science and crowdsourcing projects. 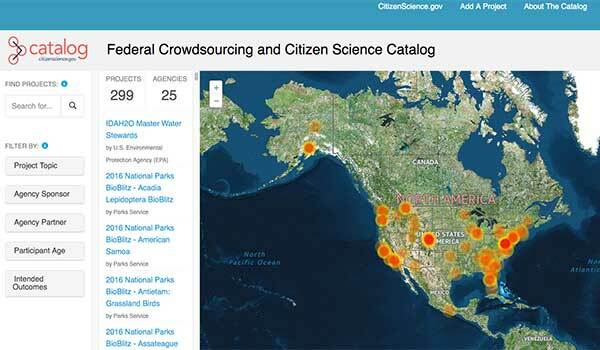 Catalogue of Federal Crowdsourcing and Citizen Science: This catalogue listing of federally funded projects will help agencies collaborate and identify opportunities for new projects. It also makes it easy for citizen volunteers and organizations outside the government to discover and explore projects. 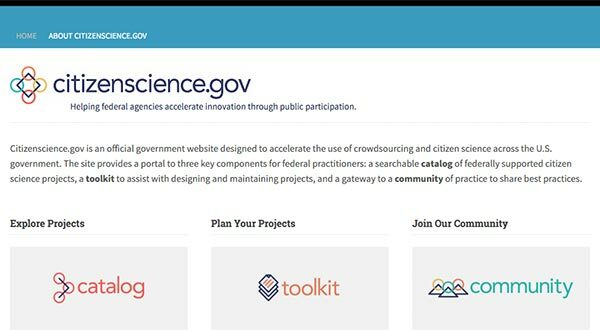 The Federal Crowdsourcing and Citizen Science Toolkit: This comprehensive toolkit was designed to help federal employees set up and manage their own projects. It includes how-to process steps, case studies, a resource library, and legal and policy resources. Federal Community of Practice for Crowdsourcing and Citizen Science: The site also provides access to a community of nearly 300 federal practitioners who share skills, resources and experiences to improve public participation across the government. It’s critical that agencies document information about different projects, not only for government use but for potential collaborations with industry and academia. By pulling all of the above resources together in one place, GSA and the Wilson Center have given federal agencies and other interested parties a clear picture of all citizen science and crowdsourcing projects in the public sector. CitizenScience.gov was not developed in a vaccuum. It has become a necessity as the field of citizen science expands both inside and outside of government. Here at GSA, it’s exciting to watch the momentum build for open innovation approaches that allow agencies to engage directly with citizens. We’ll continue to refine and improve this new site to meet the needs of federal agencies and the public. In the meantime, don’t get left behind. Visit CitizenScience.gov, talk to your friends at other agencies and start taking your issues straight to the people. « The USAGov Bilingual Style Guide Is Now Online!